Heat oven to 350°F. Spray cookie sheet with cooking spray. Place loaf of dough, seam side down, on cookie sheet. With sharp knife, make 4 or 5 diagonal cuts (1/4 inch deep) in top of loaf. Bake 26 to 30 minutes or until loaf is golden brown. Cool completely, about 20 minutes. Meanwhile, in large skillet, melt butter over medium-high heat. Add onions and brown sugar. Cook 10 minutes, stirring occasionally, until onions are tender. Add water. Reduce heat to medium-low; cook 10 to 15 minutes, stirring occasionally, until onions are golden and glazed. Set oven control to broil. Cut loaf in half lengthwise. Spread mustard over cut sides of loaf. 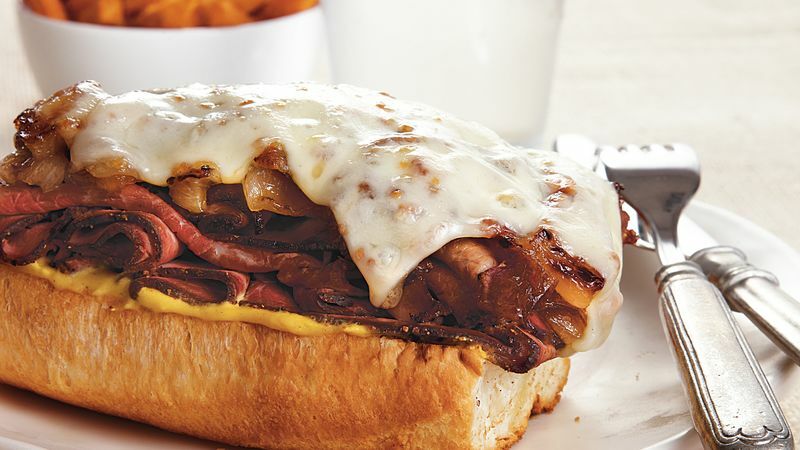 Top each half with roast beef, onions and cheese. Place sandwich halves on cookie sheet. Broil with tops about 3 inches from heat 2 to 3 minutes or until cheese is melted and light golden brown. Cut into slices to serve. Serve this sandwich with fresh fruit and sweet potato fries.